Billy Wingrove performs in front of stars including Lionel Messi, Christiano Ronaldo, Xavi, Andeas Iniesta, and legends from the game, for the FIFA Ballon D'Or awards. Billy displayed his amazing soccer freestyle skills alongside fellow football freestyler and friend Jeremy Lynch. To see their amazing freestyle football show, click here. You can now book your place on the Billy Wingrove Soccer Academy and learn the amazing soccer skills from Billy himself. The fun and exciting sessions are deigned to help develop ball control and learn when to use the skills in a game. Held at the London Soccer Dome ( former venue for The David Beckham Academy) located by the O2 arena in Greenwich, London.. The F2 take you through an amazing repertoire of exclusive skills and tricks broken down into four levels: Beginners, Intermediate, Advanced and Professional. Work your way through the stages and see if you can master each section and become a pro! Sign up to become a member and receive exclusive videos and access to Billy himself, as well as news on where & when you can catch Billy's next freestyle football performance & soccer skills coaching school. Watch the best of the world's top football freestyler on viral clips, TV shows & video games. 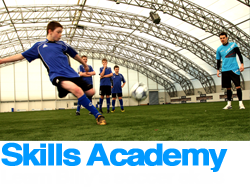 You can also see samples of Billy's Learn Freestyle Football DVD series and tutorials on his amazing soccer skills. Find out all there is to know about the man behind the football skills, including how it all began. See how football freestyle skills has led to Billy becoming a world star and working with legends such as Messi & Ronaldo.